A catalog with an essay by John Yau accompanies the exhibition. DC Moore’s new exhibition of Mary Frank’s work, Transformations: Wood Sculpture, 1957-1967 and Recent Photographs, features her dynamic wood sculptures, direct carvings from the 1950s and 60s that marked her emergence as one of the most innovative artists on the New York art scene. The exhibition also presents drawings from the same time, vibrant figures that both complement her sculpture and expand the range of her explorations of space, motion, and the rhythms of the human body. This is the first exhibition of these seminal works since they were originally shown over forty years ago. Most recently, Mary has been working with photography to create expressive images of installations that she makes in her studio by combining components of her sculptures and paintings with natural elements. The inclusion of photographs in the current exhibition brings her work full circle, spanning a sixty-year career and celebrating the strength of her unique creative vision. Mary’s wood sculptures are bold, powerfully reductive, elemental forms that resonate with a mysterious, almost magical, presence. Some, like Soul Catcher (1965-66), suggest guardian figures and totems from the indigenous world. Others evoke aspects of African, and ancient Egyptian and Chinese art. “My pieces were often human/bird, human/plant ¾ combinations of living organisms have always seemed very real to me,” she explains. In Winged Woman (c. 1960), a graceful figure balances on one leg, in a spirited posture that could be a prelude to taking flight or a choreographed pause in a dance. The solidity of its wooden medium gives way to the fluidity of an avian form that projects a sense of embodied energy. While she was carving in wood, Mary was also drawing regularly, both for and from completed sculptures. Done mainly in ink, her rhythmic figures set in expanses of space, many without horizons, attracted considerable attention at the time. 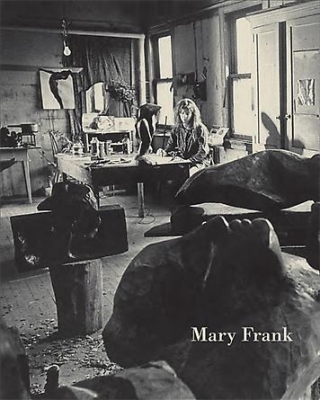 “Mary Frank is best known on the New York art scene as a sculptor, but she is also a draftsman of uncommon talent,” Hilton Kramer wrote in The New York Times in 1971. “The poetic transformations of the figure that we find in her sculpture are explored and perfected in the drawings with a marvelous lyric freedom.” Her fluent, painterly forms flow across the paper, capturing movement and gesture in momentary visual dramas. Mary continued carving and exhibiting wood sculpture until the late 1960s. By then, she was also working in plaster, wax, and increasingly, clay. As her inventive approach to ceramic sculpture became her main focus, the mythic forms that she developed during the 1950s and 60s merged into an exploration of the creative potential of a new medium, just as painting would become her primary means of expression in the 1990s. Through it all, her wood sculpture and early drawings remain singular achievements, as well as the foundation for the work that has followed. May 11, 6:30 PM: Mary Frank and Hayden Herrera in conversation.